One of the many goals of digital transformation is to create a streamlined way of getting things done, where the information needed is always available. Achieving information governance is a good place to start. When policies are executed correctly, it simply means knowing where information lives, who has access to it and how it is used—which is crucial when it comes to digitizing an entire organization. 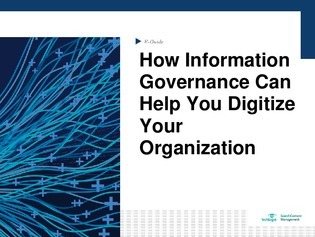 Read this expert guide to learn why achieving information governance can help you create and implement a digital transformation strategy.